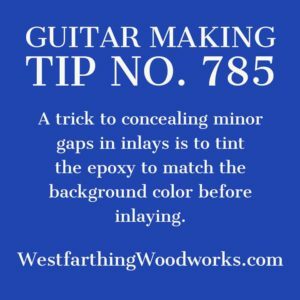 Guitar Making Tip Number 785 is about inlaying. There is one big trick that you can use to help you make better looking inlays. 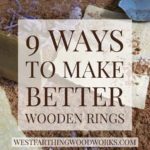 It’s easy, inexpensive, and requires almost no change to your existing process. Here is how you do it. Guitars are all going to have at least some basic inlays. 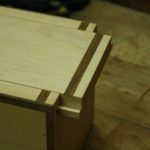 In the beginning, it’s best to keep the inlay design simple, because inlaying is a completely different skill than guitar making. 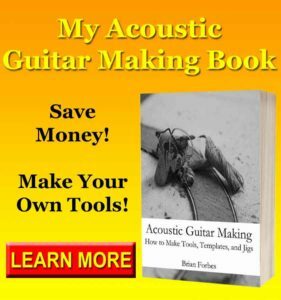 It’s such an important distinction, that I cover it in Guitar Making Tip No. 789. If you want to give yourself the best chance at accomplishing a great looking guitar, then give up on doing a huge tribal dragon inlay, where he’s shooting fireballs on all the normally dotted frets. While this is a great goal, it’s not a realistic goal for the first guitar. 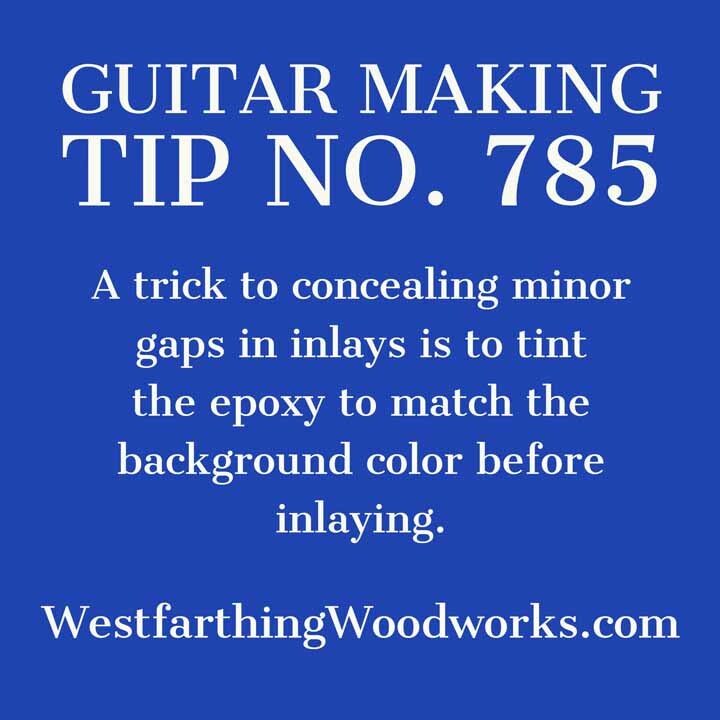 A trick that many inlay artists do is they tint their epoxy. Most inlay materials are held in place with two part epoxy. This is the best adhesive that you can use when you need to glue almost anything to almost anything else. Since epoxy is going to be the adhesive, it’s also going to serve to fill in the small gaps that inevitably happen when fitting the inlay. This is great, because you can tint the epoxy with pigments and make it match the background wood. Most inlays happen on darker woods, like the fingerboard. In a case like this, it can be almost impossible to see the tinted epoxy unless you are looking through a magnifying glass at the neck. You can find pigments from several different suppliers, but some of the best are from Mixol and Mohawk. Make sure that whatever you buy is compatible with epoxy, though most of them will work just fine. When you make your mixture, use a longer open time epoxy than five minute. Typically, a 60 minute epoxy is the best, because it will give you enough open time to get your color right before you start. Another thing is to measure out the amounts of epoxy and pigment so that you can make the same formulation a second time. Once you have measured a test batch, mix it all together and see what it looks like. It’s always better to use less pigment, because you can always add more later to deepen the color. Using regular epoxy and using tinted epoxy are the same process. When you are ready to install your inlay piece, simply coat the inside of the cavity and press the piece in place. If you are careful, only a small amount of epoxy will squeeze out. It’s good practice to coat the walls and the bottom of the cavity with epoxy. 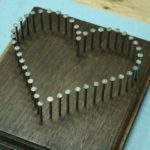 This will help the inlay adhere better and reduce the chances of falling out in the future. It will also encourage the epoxy to fill in any gaps. 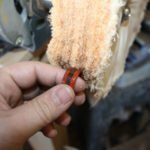 The squeeze out of the epoxy is going to do your gap filling. Allow it to squeeze up through the gaps and remain there until dry. Once the cure happens, you can come back and sand the surface flush. Since the epoxy matches the background color, it will look like the surrounding wood. 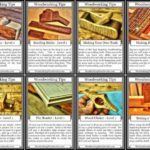 Inlaying is not an easy process, but you can make it easier. Tint your epoxy before you begin the inlaying process. When the epoxy matches the background wood, it will fill and reduce the look of any gaps in your inlay work. Over time, you will notice that your gaps become smaller and smaller. This is because you are becoming better at inlay work. I still recommend using the tinted epoxy because even on the very fine level, the extra color hiding will make your inlays look that much better. 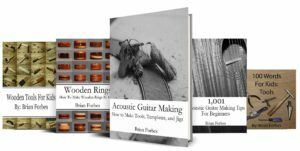 If you have any questions on Guitar Making Tip No. 785 please leave a comment and I will be glad to answer them. Happy building.